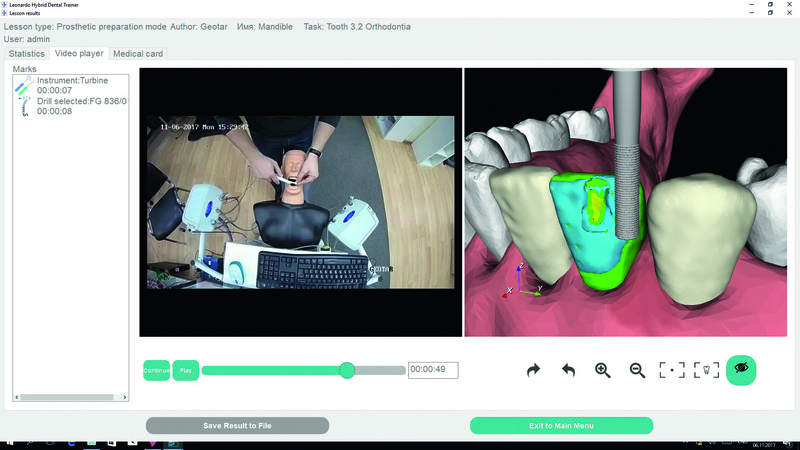 Left: GEOTAR-Media, Leonardo Dental Training Simulator Shown, Right: Software interface view of procedure. High quality dental training education requires consistency, and well-trained faculty and practitioners, along with an objective assessment of skills. Limited resources can pose a challenge for training the volume of dental students necessary. These resource constraints can include budget, a lack of research to be applied in the clinical setting and adequate, qualified teaching staff. 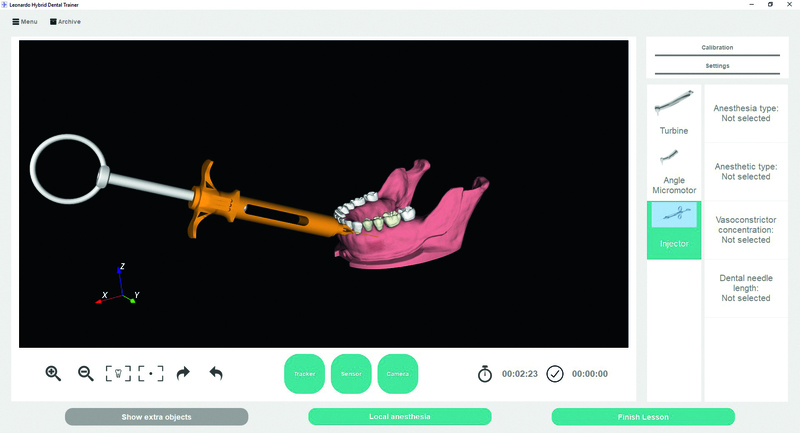 GEOTAR-Media developed a dental training simulator called Leonardo. 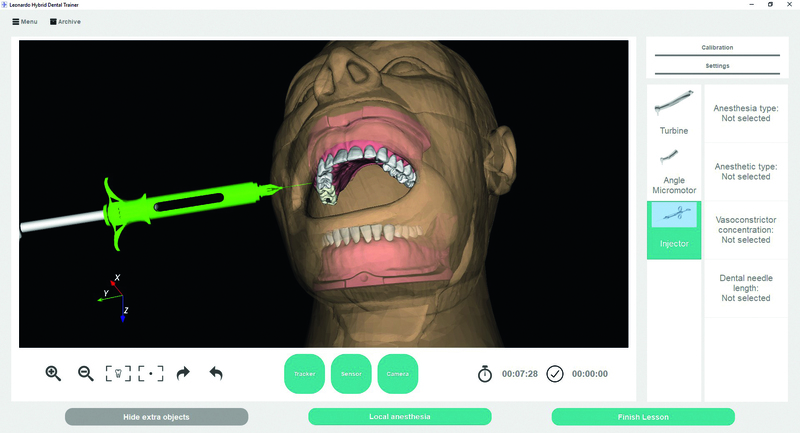 Leonardo is a dental simulator used for virtual tracking of dental instruments. It was developed as a training solution for dental students, and has a built-in objective assessment. Due to the nature of the fine motor skills needed for the dental profession, precision of movement is a key element of the training. Subtle changes in the position and orientation of a dental tool can have a major impact on a patient’s comfort level and patient outcome. Mastering the techniques are critical and creating a realistic training and simulation environment will best prepare students for the work they will do with real patients. Why Polhemus Motion Tracking Technology? By using the highly accurate Polhemus 6DOF motion tracking system, the student’s tool is tracked and measured with sub-millimeter accuracy. This is a key element of the objective assessment outcome, as a precise skill assessment can be made using the data provided by the tracking system. There is never a time when the student’s movements are blocked or not tracked due to line-of-sight issues, so no training time is wasted. 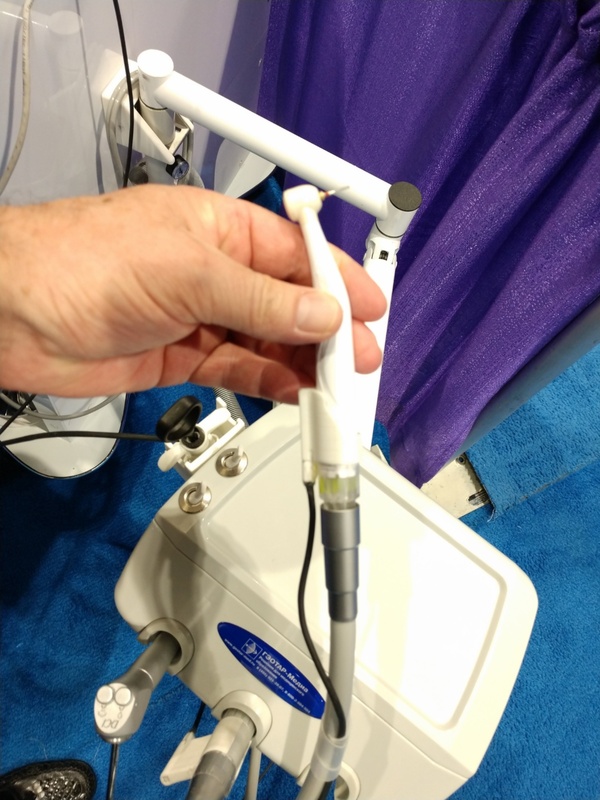 Tiny Micro Sensors™ are used that are seamlessly integrated into actual dental tools used in the clinical setting. Due to the nature of Polhemus AC Electromagnetic Tracking, system components such as the sensors and the source are fully embeddable. 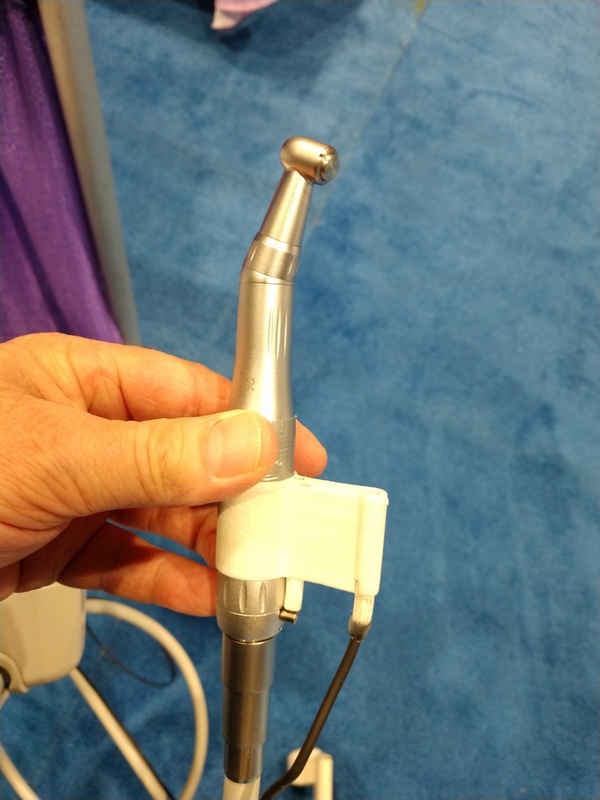 (Photo: Polhemus Micro Sensor integrated into the dental tool). Being able to use actual dental tools provides the same look and feel students will use in real clinical settings. This provides students with an environment that is most similar to a real-world environment, which is a best practice in any training and simulation experience. What About Metal and Electromagnetics? Sometimes, it makes sense when Polhemus sensors are integrated with tools to utilize a tip-offset, meaning the tip of the sensor is moved a slight distance away from the tool. A tip-offset may be used for multiple reasons. For example, it can be used to avoid the potential negative influence of certain types of metals that may otherwise affect tracking accuracy. 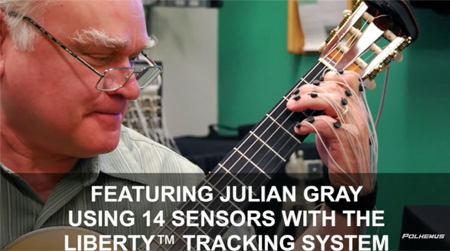 Most times, a slight offset of the tracking sensor, or other work-arounds can mitigate any potential distortion. GEOTAR-Media representative, Alexandra Alekseeva, says other technologies were attempted and most of them were optical-based technologies. They found that optical technologies had many challenges and limitations regarding calibration and ergonomics. They needed a system that you could set up one time, and then turn on and easily get started. After testing a myriad of technologies, GEOTAR-Media found that Polhemus was the best fit for the Leonardo simulator. GEOTAR-Media is the leader in medical education in Russia. Founded in 1994 as a publishing house, they’ve expanded to have a software division, and have produced over 10,000 books and journals for the medical market. They’ve developed a robust e-library that caters to physicians and medical schools. GEOTAR-Media is a distributor of over 10,000 products from more than 30 vendors around the globe. Leonardo is their signature product, created from years of experience and in-house expertise. GEOTAR-Media covers more than 40% of the entire Russian simulation market. They serve state universities, medical and government institutions, scientific and research institutes and professional societies. For more information on GEOTAR-Media, go to: www.geotar-med.ru.